built, owned and run by the people of Freshford and Limpley Stoke. See a little video about us here. Affordable basics – local produce – wholefoods – organic foods – fairtrade products – fruit and veg – milk, cream and yoghurt – wine and beer – store-baked bread and croissants – freshly prepared coffee and home-made cakes – lunches – newspapers – local books and gifts. We aim to have everything a normal household needs – with an emphasis on local, fresh, fairtrade, and a minimum of waste. 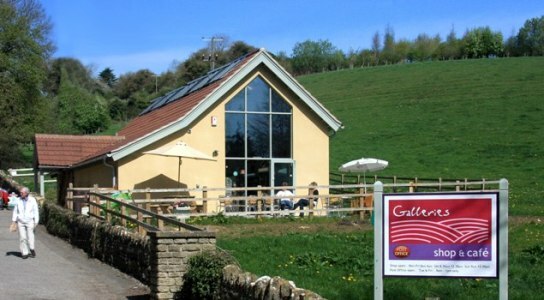 The Galleries Shop opened its doors in August of 2009, in a brand-new environmentally sound building, on the edge of the Galleries Field, adjacent to Freshford’s Memorial Village Hall. Fresh, local, seasonal food with a great range of salads, tarts, soups and cakes all made on the premises or locally. We serve freshly ground coffee and a range of specialist teas. The atmosphere is friendly, informal and welcoming. 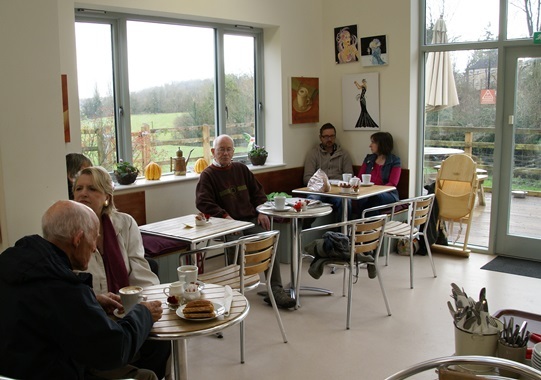 The terrace is a great place to sit, soak up the peaceful rural atmosphere and enjoy great views over the fields. It is the perfect meeting place for locals and a great stopping point for walkers and other visitors. Encourage walking / cycling / taking the bus rather than driving.